BMB is a splendid movie in the recent times. ROP direction was just awesome in each and every frame. Farhan Akthar has delivered one of the best performances of his career. Music played a vital role throughout the movie. Sonam made her presence felt. So many people didn't know about Milkha Singh prior to the release. This movie made everyone know about the legendary MS. This credit goes to ROP. This is going to sweep all the awards in the upcoming award functions. Its time for D-Day movie. First, we need to pat director for his brave attempt for selecting different genre and story. He made the movie gripping. 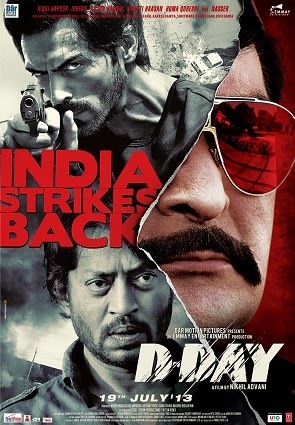 Arjun Rampal as a captain acted very well, this would stand a one of his milestones in the history. Dialogues wrote for him were very philosophical. Irfan got yet another challenging role and judgement to the role. The love shown by him towards his wife and child was good. Rishi Kapoor stole the show in the movie as an Don of underworld. Shruthi Hassan as an Pakistani prostitute acted with ease. Huma Qureshi was appealing with her beauty and expressive with her eyes. Suggestion : One time watch.